Come to Belize to experience paradise and the world’s best flats fishing. Turneffe Atoll, the largest of four coral atolls in the Western Hemisphere, is best-known for its diverse flats fishing & many other vibrant activities. This luxurious Belize resort is located on a isolated point, adorned with a white sand beach and coconut palms. Turquoise waters extend in all directions outside your front door and the bone fishing flats & vibrant coral reef are only a stone’s throw away. 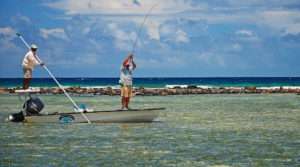 For more than three decades, Belize has been known as one of the world’s premier flats fishing destinations combining a remarkable fishery with unsurpassed natural beauty. Whether you are fishing, diving or just relaxing in paradise, we offer top-notch equipment, superior accommodations and service. The unique flats that surround this location offer the ability to sight-fish for BONE FISH, PERMIT and TARPON on any given day making it one of the few places in the world in which a grand slam is a possibility! Bone fish are present in equal numbers throughout the year and there is no clearly preferable season for bone fishing. Permit fish are also present throughout the year, although permit fishing tends to be more predictable when the prevailing winds are most consistent – generally in the winter, spring and summer. Some of our better permit fishing can be in the fall if the weather is not affected by a cold front. Tarpon fishing is quite seasonal since most tarpon are migratory. Our tarpon numbers begin to increase in April and May and drop off in June. Day 1 Arriving into Belize City where a Gage Outdoor representative will greet you outside of customs with a sign. From there we will shuttle you to the Radisson dock, where our 48′ transfer boat will take guests on to the resort that afternoon, just in time for drinks & appetizers before dinner. Day 2 – 4 After a brief Atoll Adventure orientation, guided activities will commence. 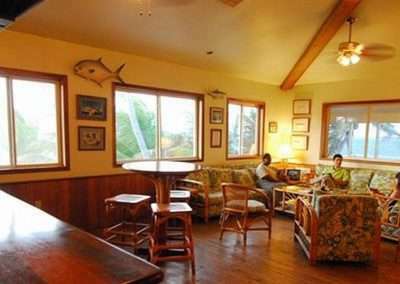 fishing, diving or other guided activities should be scheduled a day or two in advance while at the lodge. Day 5 Transfer by boat to Belize City & your flight home. Custom packages available – PERFECT FOR FAMILY VACATIONS! An additional transfer fee may be required if arrival/departure other than on regularly scheduled days (typically Saturday and Wednesday). All rates are double occupancy except as noted for the single supplement (private boat & guide) fishing package.